We’d love your help. 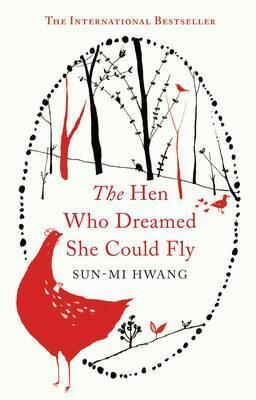 Let us know what’s wrong with this preview of The Hen Who Dreamed She Could Fly by Sun-mi Hwang. 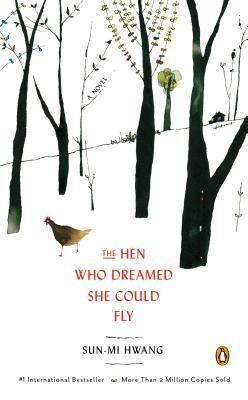 To ask other readers questions about The Hen Who Dreamed She Could Fly, please sign up. any ideas about what this book would be rated under a kids book rating scale a-z? My daughter needs to read a book rated z or z+ and we are wondering if this would fall under that? *سأكون بخير، إني أتذكر أشياء كثيرة جدا..لن أكون وحيدة. *عرفت أن هذا اليوم سيأتي لكنها لم تخبره بكل الأشياء التي تشعر بها، حتي إنها لم تودعه. تذكرت كل القصص التي تحبها و أرادت أن ترويها له ذات يوم، و لم تتحول تلك الأفكار لكلمات، لكنها انطلقت كصرخة. Isn't it weird, how a book will sometimes speak to you from a book store or library, call your attention to it and demand that you take it home? That's what happened with me and this skinny novel last week. I saw it in a book store, pictured the unread books in stacks next to my bed, and ignored it. But as I walked on by, the little hen on the cover called out my name. I knew nothing about this book, other than it was translated into English from Korean lit. As I started it, I realized the pull wa Isn't it weird, how a book will sometimes speak to you from a book store or library, call your attention to it and demand that you take it home? I knew nothing about this book, other than it was translated into English from Korean lit. As I started it, I realized the pull was something more; this was a story told in the spirit of Watership Down and Animal Farm; meaning, a tale of animals that live together and communicate as humans do. I don't know why, but these stories have always worked for me. I blame The Bremen Town Musicians in my youth. Sprout, when we first meet her, appears diseased and has been left for dead in a pile of chicken carcasses. She escapes, but she's made an enemy of a relentless weasel and it seems like she'll never fulfill her dream of becoming a mother. And, before you know it, you want Sprout to become a mother as badly as she does, and when she finds that abandoned egg in a nest, you're almost praying that it hatches. And this Caucasian mother ached for Sprout and can remember so clearly boarding an airplane on a Chinese airlines and having a Chinese man spit on her, kick the back of her seat in disgust the entire flight, and then get out of his seat repeatedly to stick his finger in her face and curse in Mandarin at her. Oh, yes. I've been Sprout. I've been badgered, I've been stared at (as have my kids), and I've had some of the nastiest things said to me that aren't worth strengthening by repeating. I have had to spread my wings wide over their heads to protect them and bolster them inside for the day they become too big for my wingspan. This is a book that is written in simple language, with a simple message: life is tough, the enemy is ever-present, but you have courage and joy inside you. Seek what you want and need and stand tall. Η Μπουμπουκίτσα, μια απλή,τρυφερή,παραπονιάρα και ασυμβίβαστη κοτούλα συμβολίζει τη γυναικεία ύπαρξη μέσα στην ανθρώπινη κοινωνία με όλα τα χαρακτηριστικά και τις ιδιότητες που μόνο μια γυναίκα μπορεί να έχει και να βιώνει. Ως άνθρωπος που αγωνίζεται σε μια άνιση μάχη για κάτι άπιαστο και δύσκολο. Για ένα ανεκπλήρωτο πόθο ή όνειρο ζωής. Ως μητέρα που λαχταράει το δικό της μωρό και δίνει με ανιδιοτέλεια και τη τελευταία της ανάσα για αυτό. Με απέραντη τρυφερότητα και αγνή συμπόνοια βλέπουμε την Μ Η Μπουμπουκίτσα, μια απλή,τρυφερή,παραπονιάρα και ασυμβίβαστη κοτούλα συμβολίζει τη γυναικεία ύπαρξη μέσα στην ανθρώπινη κοινωνία με όλα τα χαρακτηριστικά και τις ιδιότητες που μόνο μια γυναίκα μπορεί να έχει και να βιώνει. Με απέραντη τρυφερότητα και αγνή συμπόνοια βλέπουμε την Μπουμπουκίτσα να λατρεύει ενα μωράκι που δεν γέννησε η ίδια όμως το μεγάλωσε με αυταπάρνηση. Ως αφοσιωμένη και πιστή φίλη για κάποιον "παρείσακτο" που τη βοήθησε σε δύσκολες στιγμές και του χρωστάει παντοτινή πίστη και μεγάλο σεβασμό. Ως υπόσταση με ψυχή και απέραντη αγάπη για τη ζωή και την εξέλιξη. Αγωνίζεται πέρα απο κάθε προσδοκία με δυνάμεις που υπερβαίνουν τον εαυτό της, να παει-ένα βήμα,ένα όνειρο,έναν στόχο,ενα ιδανικό- παραπέρα, να λυτρωθεί απο το μοιραίο κατεστημένο. Να αγωνιστεί, να θυσιαστεί, να ξεπεράσει τον εαυτό της και να πετάξει. Να επιβιώσει, να μη γίνει θύμα και υποχείριο κανενός. Η Μπουμπουκίτσα ειναι μια ηρωίδα κόντρα σε όλα τα κοινωνικά συμβατά. Κόντρα ακόμη και στην ίδια της ταπεινή γενιά ως κοτούλα. Αντιπροσωπεύει τη γυναίκα ειδικά αλλά και την ανθρώπινη ύπαρξη γενικά. Η Μπουμπουκίτσα διδάσκει αγάπη,και πίστη στον εαυτό μας. Μας δίνει κίνητρα και στόχους για να αγωνιζόμαστε ξεπερνώντας ολα τα εμπόδια. Μας οδηγεί στην αυτοθυσία για ότι ποθούμε και λαχταράμε με την ψυχή μας και μας ανυψώνει σε ανομολόγητη ευτυχία. A strange little book I picked up by mistake. A pleasant enough mistake, though. It’s a Korean fable about dreams, identity/difference, courage, and what makes a mother. It may not be startlingly original or uniquely profound, but that’s part of its charm. It could easily be a children’s book, though the beautiful, simple illustrations are perhaps too few for younger children. Sprout is an aging hen in a coop, who longs to hatch an egg. She escapes the coop, escapes a weasel, and finds a newly-hatched, abandoned egg. But it’s a duck egg. She loves her baby as her own, but the fowl in the farmyard are outraged. The poor ducking (Greentop is not an ugly ducking) is ostracised by hens and ducks, being neither one thing nor the other. To a Brit, this shouts a message about multiculturalism, mixed-race children, and inter-racial adoption, but to Koreans, it may relate more to North and South Korea. I was struck that in English, "mothering" is something anyone can do, whereas "fathering" is limited to those who sire a child. That hides an important truth. Adult or child, male or female, we all need both sides of the mothering/mothered relationship in our lives. With that, maybe we can learn to fly. •	“Ever since she named herself, she’d gotten into the habit of noticing events occurring outside the coop.” Names are empowering. The Publisher Says: This is the story of a hen named Sprout. No longer content to lay eggs on command, only to have them carted off to the market, she glimpses her future every morning through the barn doors, where the other animals roam free, and comes up with a plan to escape into the wild—and to hatch an egg of her own. My Review: Jonathan Livingston Seagull meets Babe. To compare the book to Charlotte's Web is damned near heresy. In every generation, there's another fable of Independence Declared by ____ and the Struggles of _____ to xxxx. This is the 21st century's international publishing phenomenon in the genre, which the provincial, smugly self-satisfied Murrikin Megapublishers got 15 years after most places did. If you're 14 and a sad, lonely, misunderstood girl, this is ideal to stuff into your locker. Also a grandmother's ideal gift for same. Older folks who've just become grandparents, adoptees and their mommies, those who are sentimental as all get-out, queue up for your copy. She want to become a real hen and hatch an egg. So, in other words, Motherhood Makes the Hen. This is not a message I think needs further spreading. It has metastasized in our various cultures to the point that rich first-world folks go buy themselves a baby girl at the Chinese Baby Bazaar, or spend absurd amounts of money doing medical hoo-hah and get themselves their very own genetic descendants.
" هناك شيء ما يحدث في هذا العالم على الدوام، هناك كائن ما يموت وآخر يولد، هناك فراق ولقاء في الوقت نفسه .. يعني ذلك أنّه يستحيل علينا أن نحزن إلى الأبد. " عن الحياة، عن المثابرة، والأحلام، عن الطموحات والسعي الحثيث لتحقيقها، عن الصبر في مواجهة تقلبات الحياة، عن النفوس النقية التي لا تشوبها شائبة .. قصة جميلة وخفيفة تستحق القراءة أيضا. وتحريض أخلاقي يستحق الإطلاع عليه، دجاجة تحلم بالطيران .. رغم امتلاكها لجناحين- حق فطري- فهي عاجزة عن ممارسة هذا الحق ولكن الرغبة في ممارسته غير منزوعة تمامًا من نفسها، روح التمرد التي تلازمها استدرجتني نحو عالمها البسيط بتعقيدات نثرتها الروائية الكورية ( صن مي هوانغ ) فيه ببراعة..
تزعّمت اشتراكية أورويل من خلال رواية مزرعة الحيوان ذهني لفترة طويلة، بمعانيها و جدواها ومبادئها، و جاءت هذه الرواية لتقنن قدر غير يسير من أحلام الجميع هناك في المزرعة و تختزله بشكل إنساني و وجداني دافئ أكثر في شخص الدجاجة إسباك، إسباك مثلت القابل للإنكسار بكل ثقة دون خشية من العواقب، توزّعت الأحلام عند أورويل ولربما توزع الإيمان و الأفكار بتوزع المهام و الطموحات، توزّعَ ما نجحت الدجاجة بتجميعه في صدرها المنزوع الريش و بريشاته المنثورة في قاع العش لتدفئة بيضة فرخ البط البري . تبدأ الدجاجة إبساك الرواية بالنفير الثوري الداخلي الذي يواكب كل رغبة لتغيير مسارات حياتنا الخمولة و المستكينة .. لربما - بسبب التعود - ألفناها على مضض ف بات الواقع يُحتّم علينا لجمها والتصدي لها .. و هذه عبرةٌ لمن يؤمن بأن - التغيير - فريضة استمرار بقاءه الشخصي.. و إلا فلا ! تلاشي رغبة الطعام هي دعوة لإضراب آخر ، حياة إبساك عبارة عن حزمة من الأحلام سيكسرها الواقع تباعًا للأسف، حتى تستلم للطيران الوحيد الذي تتقنه أرواحنا الهزيلة..! ( إنها الأم التي لن تتمكن من البقاء على قيد الحياة إذا لم تركض بمثل سرعة الرياح ..
اخلق من البساطة عالم روائي هاطل مذهل. Η Μπουμπουκίτσα είναι η πιο γενναία κότα στον κόσμο. Μια ιστορία συγκινητική,τρυφερή με πολλή πολλή αγάπη. The protagonist, a caged laying hen, has already committed her first act of rebellion at the opening of the story: she has carefully and lovingly observed an acacia tree through an unintentional gap in her enclosure and concluded that the SPROUT is the key to the cycle of life that the tree's seasonal variations embody. She names herself after the part of the tree that 'gives birth' to the leaves and flowers, claiming her right to self-determination and a place in the cycle of being. As an exploited prisoner Sprout is forced to produce food for humans. The farmer and 'the farmer's wife' see animal bodies as property: machines that make profit or food for them. Sprout's eggs are taken away as she cherishes the hope of hatching a chick and becoming a mother. Although her eggs are not removed from the cycle of social reproduction totally (they are eaten) she herself has no further part in their existence after her body has produced them. In protest she refuses to continue laying. Sprout's rejection of her exploitation links, I think, to the reproductive justice framework developed by African American women, which centres the body autonomy and health issues of marginalised women, including those who are incarcerated. An RJ framing would affirm Sprout's right to become a mother as well as her refusal to perform reproductive labour. Sprout's marginalised status is further explored when she finds herself among the group of animals in the yard who have a slightly greater measure of freedom but are still exploited by the farmers. The group rejects her and she is told to return to the coop. Only very reluctantly do they allow her shelter and they drive her away from their food violently although there seems to be plenty of it. A wild mallard duck who has managed to gain a precarious place at the margin of the elitist community, which is also deeply divided along species lines, is Sprout's only friend. She enjoys foraging free range in the fields, but does not feel safe as she has met a dangerous predator, the weasel. Disrupting the haughty speciesism of the yard animals, Hwang makes Sprout a surrogate mother to an orphaned duckling. Thus, parenting is not biologically determined or bounded and inter-species relationships are affirmed. Sprout's mallard friend tells her 'we look different […] but we cherish each other in our own way'. Later she repeats this idea to her adopted son. Life in the wild is fraught with anxiety and struggle, but in a confrontation with the weasel, Sprout realises that her liberated existence with her son has been happy. The circle of beings is doubly affirmed by her interactions with her nemesis. من الممكن أنك لم تخلق يوماً للطيران ولكن من المحتَّم أنك عندما تؤمن بجناحيك ستأخذك إليى حيث لم تطأ قدماك يوماً ستأخذك إليى حيث حلمك وستحلق بك إلى السماء ..
رواية الآلام و الأحلام بامتياز ، تحكي عن إبساك الدجاجة التي تمردت على نظام الحظيرة و هربت للغابة سعياً لإشباع حلمها باحتضان و تفقيس البيض ، و ما تقاسيه في رحلتها من مخاطر و تحديات ..
و خاصة في النهاية الكارثية لإبساك التي كانت عبارة عن تغنّي بالحرية و الأمومة و التضحية في سبيل الغير . Συγγνώμη παιδιά, αλλά το βρήκα τρομερά γλυκερό για τα γούστα μου. رواية رقيقة جدا متخمة بالمعاني العظيمة: الحلم، الحرية، الأمومة، التضحية، الشجاعة، الحكمة، الفداء. رواية غاية فى الحسن والجمال وذات معاني ومقاصد فاضلة، فيُنصح بقراءتها. 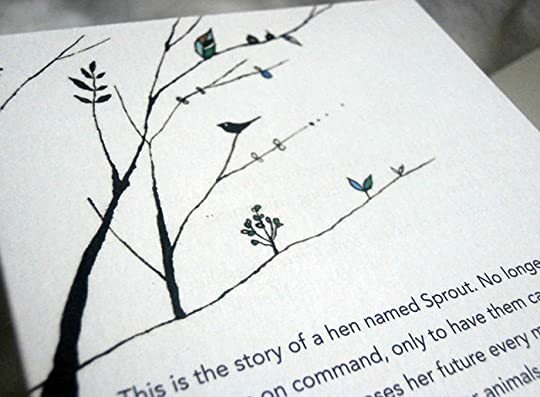 This is a much beloved story from South Korea about an egg-laying hen named Sprout. Sprout dreams of nothing more than to roam free and be able to hatch an egg and care for a chick of her own. This allegory is often compared to Charlotte's Web. With a cast of memorable talking animals and themes including friendship, longing, unconditional love, and self-sacrifice, this delightful tale is worth the hour or two invested. جميلة جميلة جميلة جدا !! Εντάξει νομίζω ότι ήδη ακούω τα φωναχτά γέλια μιας αγαπημένης μου φίλης όταν θα δει στο goodreads ότι επιτέλους διάβασα την κότα. Surprise girl. Και εδώ που τα λέμε καθόλου δε θα την αδικήσω δεδομένου ότι είχα κάνει αντίστοιχα γέλια όταν μου πρωτοανέφερε τον τίτλο του βιβλίου. Για την ακρίβεια και αυτολεξεί την ξέχ….. για τις μ….. που μου δείχνει και να μην με απασχολεί με ηλίθια βιβλία. Μα πραγματικά όμως πόσο μέσα. 5 αστεράκια χαριστικά χαχα. Ξεκίνησα αυτό το χιουμοριστικό πρόλογο περισσότερο Εντάξει νομίζω ότι ήδη ακούω τα φωναχτά γέλια μιας αγαπημένης μου φίλης όταν θα δει στο goodreads ότι επιτέλους διάβασα την κότα. Surprise girl. Και εδώ που τα λέμε καθόλου δε θα την αδικήσω δεδομένου ότι είχα κάνει αντίστοιχα γέλια όταν μου πρωτοανέφερε τον τίτλο του βιβλίου. Για την ακρίβεια και αυτολεξεί την ξέχ….. για τις μ….. που μου δείχνει και να μην με απασχολεί με ηλίθια βιβλία. Μα πραγματικά όμως πόσο μέσα. 5 αστεράκια χαριστικά χαχα. Ξεκίνησα αυτό το χιουμοριστικό πρόλογο περισσότερο για να κερδίσω χρόνο να σκεφτώ τι θα γράψω για το συγκεκριμένο βιβλίο. Είναι μόλις λίγα λεπτά που το τελείωσα και νιώθω αυτό ακριβώς το κάψιμο στο στήθος όταν έχω τελειώσει ένα βιβλίο που είχε πολλά να μου πει. Ένα βιβλίο πραγματικά στολίδι για κάθε βιβλιοθήκη, ένα βιβλίο για κάθε αναγνώστη, ένα πραγματικό μεγάλο βιβλίο που στις λίγες σελίδες θα σας κάνει να νιώσετε τόσα πολλά. Η κότα που ηθελε να πετάξει. Το ξαναλέω πόσο είχα γελάσει με τον τιτλο και πόσο χαζός μου χε φανεί. Και όμως πόσο λάθος γιατί είχα επιλέξει την επιφανειακή ανάγνωση όμως τώρα καταλαβαίνω την αλληγορία ότι ουσιαστικά αφορά την επιθυμία που έχει ο καθένας από μας να πιάσει το άπιαστο, να φτάσει στα ουράνια και ακόμα παραπέρα. Να πετάξει, να ανοίξει τα φτερά του, να ξεφύγει από τη φωλιά του και από τα στερεότυπα που τον συνοδεύουν. Το όνειρο της υπέρβασης μέσα από τα μάτια της γλυκιάς Μπουμπουκίτσας μιας χαριτωμένης κότας. Για να μια ειλικρινης ίσως και το ταιμινγκ που διαβάζω το βιβλίο αυτό να είναι το σωστό. Σε μια περίοδο που με απασχολούν διάφορα στο μυαλό και μάλλον κοιτάω το μέλλον με απαισιοδοξία η μικρή μπουμπουκίτσα μου παρέδωσε μικρά μαθήματα αισιοδοξίας. Μέσα από τα μάτια λοιπον μιας αγωνίστριας κότας συμβολίζεται ο κάθε άνθρωπος ο οποίος αρνείται να συμβιβαστεί, αγωνίζεται με όποιο κόστος συνεπάγεται ο αγώνας αυτός . Τα όνειρα για μια καλύτερη ζωή απαιτούν στόχους αλλά και συνάμα θυσίες, ανιδιοτέλεια, κίνητρα και είναι ακριβώς αυτά τα κίνητρα που θα σε οδηγήσουν στο κυνήγι της προσωπικής σου ευτυχίας. Και πόσο αληθινό η διαπίστωση μέσα από το βιβλίο ότι τελικά η αποδοχή και ο σεβασμός αλλά και η αγάπη δεν έρχεται πάντα από τους όμοιους με εμάς αλλά πολλές φορές από κει που δεν το περιμένεις. Εκεί ακριβώς φαίνεται και το μεγαλείο της ψυχής, της ψυχής εκείνης που αρνείται να υποταχθεί που θα εξευτελιστει, θα χλευαστει θα πονέσει αλλά δε θα εγκαταλείψει τον αγώνα. Ένας ύμνος στη ζωή, την αυτοθυσία, ένας ύμνος για όσους τολμούν να κυνηγήσουν τα όνειρα τους ακόμα και αν ο θάνατος είναι το συνεπακόλουθο αυτών. Ένας ύμνος για όλους εμάς που καμιά φορά χάνουμε το πραγματικό νόημα της ζωής!! This was a really cute story told from a hen's perspective. It's a story that deals with animals, but it's really about aspects of life that are really important and relevant; such as motherhood, bullying and protectiveness. This book definitely provided me with a different reading experience since I was inside a hen's head. It was refreshing to read from this point of view, and I especially liked how I could still very much identify with this hen. Even though the story is about important topics This was a really cute story told from a hen's perspective. It's a story that deals with animals, but it's really about aspects of life that are really important and relevant; such as motherhood, bullying and protectiveness. باختصار أقول: درسًا عن الأمومة. كيف لا وكديشون أيضاً رمز! وتساؤلات عن عدم قدرتها على الطيران رغم امتلاكها لجناحين! التحرّر من القفص والجلوس تحت شجرة الخرنوب الأسود. فشل ابن عرس في مسعاه بعد أن تمكّن الرأس الأخضر من الطيران. _ هنالك شيء ما يحدث في هذا العالم على الدوام. هنالك كائن ما يموت وآخر يولد. هنالك فراق ولقاء في الوقت نفسه تقريبا. _ لا أدري لماذا حياتي صعبة هكذا. _ "يُحتمل أنّنا مختلفان لكن بإمكاننا أن نحبّ بعضنا. _ يجب عليك أن تتصرّف حسبما تتمنّى بالفعل. الرواية تُصنّف على أنّها عظيمة. عنوان الكتاب: الدجاجة التي حلمت بالطيران "رواية"
دجاجة وفرخ بط جعلاني أُجاهد مجهشاً بالبكاء لألتقط أنفاسي . رواية بسيطة مرهفة ومتعددة المعاني . One wonders if Aesop knew how much of good thing he had when he wrote his fables, that years and years later, that the idea of animal characters being used as allegory would still be current. Today, most people think of Animal Farm when discussing allegories using animals, but perhaps in later years it will be Animal Farm and the hen Sprout, the heroine of this charming and deeply moving tale. While no doubt highly influenced by Korean culture, Sien-Ma Hwang’s story also draws on Western classics like “The Ugly Duckling” and “The Little Red Hen”. Sprout starts her story trapped in a cage fulfilling her heart breaking duty of laying eggs. She eventually gets out and struggles to find a place in the outside world, a place where she has longed to be but that comes with dangers that she didn’t know about it. Due to a series of circumstances, she finds herself in charge of an egg. While the book is mediation about family, love, and motherhood, it is also a close look at nature as well as the influence of man on nature. The fictional character closest to Sprout in the history of literature seems to be HCA’s Little Mermaid. The idea of scarf ice for the greater purpose and the morality of it is something that both characters share to a great degree. It also is impossible to read the beginning of the book and to not think of North Korea. Sprout’s journey starts in the most horrific way (and it will most likely insure that you confine chicken eating to free range). But if the coop is North Korea than is the barnyard the South? It is better but not a paradise. The allegory works because becoming who you are transcends society, even a benign one. It’s strange considering how short the book is the large impact that it has. Putting the book down, leaving Sprout in some ways is like cutting off a limb, disconnecting your mind from something, it’s a wrenching feeling. This is despite the almost starkness of the prose. If the Narnia books are an allegory overboard, Sprout’s story is an allegory grown properly. Not the sort of thing I usually read, this is a parable/fable which can easily be read by adults or children with line drawings between each chapter. It is the story of a battery hen who has named herself Sprout who dreams of being free and being able to actually hatch an egg of her own. She looks out of her cage enviously at the animals who are free in the farmyard. Events combine so that Sprout does escape. She is not accepted in the hierarchical world of the farmyard because of where she has come from, although one of the male, ducks, called Straggler, does speak not her. He is also an outsider. Not being in the farmyard leaves her in danger from the main predator in the area, a weasel. Straggler and another duck produce an egg away from the farmyard, but Straggler’s mate is taken by the weasel. Sprout sits on the egg until it hatches, during which time Straggler is also taken by the weasel. Sprout is left to bring up a duckling alone with opposition from the animals in the farmyard and the ducks on the reservoir and Sprout’s struggles with the weasel, the weather and with bringing up a duckling make up the rest of the book. Ίσως είναι η πρώτη και τελευταία φορά που με εξέπληξε ευχάριστα μια κότα. 5 αστέρια σε αυτό το αριστούργημα είναι λίγα πολύ λίγα !! Hwang Sun-mi (born 1963) is a South Korean author and professor who is best known for her fable The Hen Who Dreamed She Could Fly, which has also been made into a successful animated film in South Korea, Leafie, A Hen into the Wild. She was Born in 1963, Hwang was unable to attend middle school due to poverty, but thanks to a teacher who gave her a key to a classroom, she could go to the school and Hwang Sun-mi (born 1963) is a South Korean author and professor who is best known for her fable The Hen Who Dreamed She Could Fly, which has also been made into a successful animated film in South Korea, Leafie, A Hen into the Wild. She was Born in 1963, Hwang was unable to attend middle school due to poverty, but thanks to a teacher who gave her a key to a classroom, she could go to the school and read books whenever she wanted. She enrolled in high school by taking a certificate examination and she graduated from the creative writing departments at Seoul Institute of the Arts and Gwangju University, and from graduate school at Chung-Ang University. She lives in Seoul, South Korea.Hwang is an adjunct professor at the Faculty of Literature in the Seoul Institute of the Arts. Hwang's career as a writer began in 1995, and since then she has published nearly 30 books over various genres. She is most famous for her work "The Hen Who Dreamed She Could Fly" which was also made into a movie that broke Korean box office records for animated films, earning nearly 7 billion won in its first month of release.